What comes to mind when you hear that name? 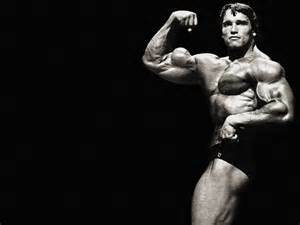 For some it is a black and white picture of the most impressive physique of all time. For others it is an action film star, failed governor or even cheating husband. And he’s all of these things. But above all else, he’s driven and successful. Wanna be like Mike? Go ahead, I’d prefer to be like Ah-nuld. Leadership coaches and others will tell you that if you can develop your strengths you can frequently work around your weaknesses. While this can be true, it’s a terrible message and wholly inaccurate if you have a truly fatal flaw. Wouldn’t it be better to eliminate your weaknesses with hard work? Such was the case for Schwarzenegger. In the 60’s a teen Arnold was embarrassed in competition because of his weak calves. He possessed the total package of a physique, but it was all perched on top of a pair of chicken legs. He had always struggled to build the calves that would give him the symmetry he needed to win. To seek out the king of calves Reg Clark for consult. Only he didn’t stop there, he committed to getting up at five in the morning to train with the legend and even cut the bottoms off of the legs his sweatpants to keep his focus on his adversary. For set after set over the course of weeks he worked Clark’s system, trusting something that was totally new to him. His trust in his mentor was rewarded and all of that hard work eventually delivered the sickest calves on the planet. A weakness turned into a strength through trust, focus, goal-setting and hard work. In 1988 Arnold Schwarzenegger was already a huge star. From Conan the Barbarian to Running Man, Predator and Commando plus many more, he had essentially become his own genre. The Terminator could have hammered dozens more films exactly like those he had already done. Only that isn’t how successful people are wired. In fact, you could argue, if he were wired that way, he’d have never left bodybuilding. Ever the entrepreneur, Arnold had conquered the action film, it was time to find a new challenge. He found it in comedy. Arnold wanted to stretch himself, but he also knew he didn’t know the first thing about comedic acting. So he enlisted the help of Ivan Reitman, a master of the genre. Together they picked a project and the rest is history. The resulting project Twins, became the most profitable movie of his entire career. Were you surprised to hear that Twins was the most profitable movie of Arnold’s career? There is a reason for that. You see Arnold made the movie for free. Instead of a salary and despite never having done a comedy, he bet on himself in a royalty deal. No pay for the film, instead opting for 20% of the back end. That back end resulted in a full $35 million dollar payday. All because when no one else thought Arnold could pull off comedy, he banked on himself. One could easily write Arnold off because of his well-publicized moral failings. You could choose to ignore him due to an inconsistent run as Governor of California. To do so would be foolish. Schwarzenegger is the epitome of the entrepreneur. He went from enterprising immigrant to seven time Mr. Olympia, to the biggest film star on the planet. Then for good measure he became Governor of our most populous state. He has re-invented himself and risen to success at virtually everything he’s tried. But the other thing you’ll note about our story is yet another consistent theme. He didn’t do it alone. Arnold was continually seeking out the best of the best and asking for help. Ivan Reitman, Reg Clark and many others. Arnold is widely considered a self-made man, but he’s clearly not. Making him just like you… minus those sick calves of course. Unfortunately the message here does get diluted by the ‘what have you done for me lately’ mentality. As driven and successful as Arnold has been, he is not immune to temptation. His story is inspiring and shows we all need find our drive and get help along the way. It’s too bad his story has a dour turn, however I suspect the positive aspects of his story may not be done.